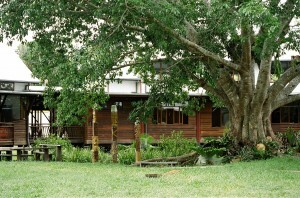 Shearwater, the Mullumbimby Steiner School, is nestled among the green hills of the Byron Shire hinterland, 3.5 km from “the biggest little town in Australia”: Mullumbimby, New South Wales. Along Left Bank Road and backing on to Mullumbimby Creek, the property was part of the XIXth century rural development of the Mullumbimby Valley that cleared the rainforest to make way for grazing and, later, banana plantations on its north-easterly facing slopes. Our School acknowledges that it stands in Arakwal Country, a part of the Bundjalung Nation, and we take this opportunity to pay our respects to the traditional custodial owners, both past and present, as well as to the elemental and spiritual beings that cohabit this place. 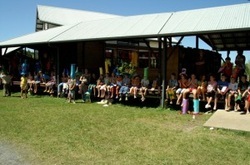 Shearwater commenced teaching Kindergarten and a combined Class 1 and 2 in the home of Stan Stevens and Sally Davison on February 8th, 1993. These premises soon exceeded their capacity and the current site was found, purchased and duly occupied in September 1993 with the existing Reception Centre converted into a number of classrooms and offices. On occupying the land, an audit of trees was immediately completed and a rare and endangered species of sweet myrtle (Gossia Fragrantissima) was discovered. 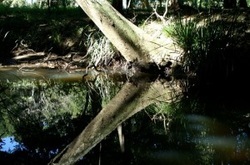 An environmental grant to commence a rainforest creek regeneration program centred around the protection of the sweet myrtle was applied for and received. Since, a number of similar grants were received and under the care and dedicated work of Ken Ohlsson, some 5000 native trees have been planted. The architect, David Jacobson of Baxter and Jacobson, surveyed the land, took our brief and commenced drawing the School master plan. Sensitive to the existing environment, David took as a focus for the School buildings a maturing white fig tree (Ficus Virens). This deciduous species was inspected by a tree specialist and was estimated to be some 50 years old and in a healthy condition with an expected life span of 200 years. Since then the primary school, library and administration buildings partially encircle the fig. Commenced in 1993, with 37 pupils under the care and guidance of Beverly Clarke (Kindergarten) and Konrad Korobacz (Classes 1 and 2), Shearwater’s numbers have now increased to full classes ranging from Play and Craft group for 18 months old to Class 12 for 18 years old! The School is under the direction of 33 full-time and 36 part-time Teachers. The Office Support team is led by the Business Manager, as is the grounds staf. Recognised as the fastest growing Steiner School in Australia, Shearwater has established double streaming for the first time its Classes 1 and 7 in 2006 and today most classes are double streamed. Early in 2006, the School also took possession of a property adjoining their western boundary. This 15 hectare parcel, including an extensively renovated house where our Play and Craft groups already meet, is a valuable addition to the Shearwater grounds struggling to meet the demands of a growing school. There will now be space available for playing and sports fields, biodynamic gardens and orchard and further buildings. In 2009 and recently in the beginning of 2011 the new Art and Design complex and two Science laboratories and additional classrooms in High School have been finalised. Plans to extend our successful Rainforest Creek Regeneration Project along the newly acquired section of Mullumbimby Creek have already commenced.